In today’s world, there are tons of record companies and labels out there. Some promise to make you the next biggest thing, others will help you produce an album, others will sign you for life, and then there is United Artists Alliance Music. The one that is… different. I have put off writing this article for a while because I didn’t want to burn anyone too bad, but after I had the misfortune of working for them, and time has gone on past the point to which I really don’t care anymore, I figured that I would let all of you potential artists or production assistants know to beware of these guys. In short, they are one of the most disorganized, poorly run, and poorly prepared group of people that I have worked for; and I’ve done a lot of side jobs for a lot of people. I have constantly run into situations when listening to a movie or video game and said, “that’s not the right sound!” My solution? I am releasing sound libraries to combat that. As of writing this blog post, there are only two, but there are plenty more on the way. 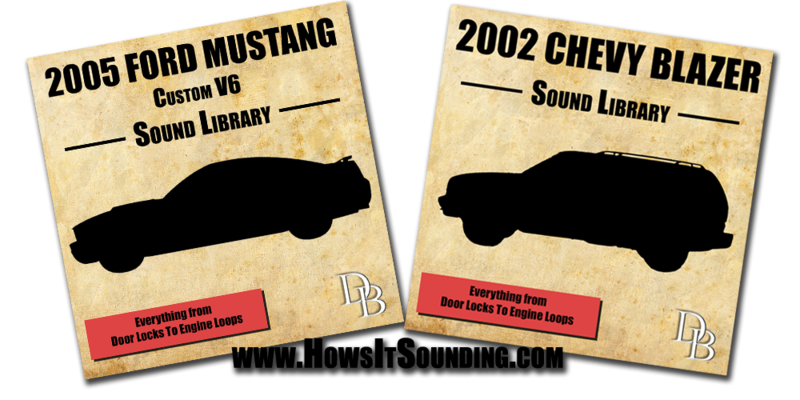 So far they are car specific libraries: a 2002 Chevy Blazer and a custom 2005 V6 Mustang. Now the next time you are working on a movie and need those two vehicles, you have the right sounds! Don’t need those exact ones? Well the Blazer is perfect for any full sized SUV, and the Mustang is great for any sports car! So what do you get? Basically if it makes a sound, it’s recorded. This is everything from door locks, glovebox opening and closing, engine loops at idle, mid range RPM, and high RPM from inside, in front, and behind the vehicles, drive-bys, creaks and rattles, and SO MUCH MORE. Each library has over 60 files, and most files have more than one sound giving you a crazy amount of sound effects to use! Want more? Well, the first one is free. That’s right, for a limited time, the 2002 Chevy Blazer is yours to download at no charge. Enjoy these libraries, and let me know what you use them for!